Saturday’s episode of The Voice India opened in style with host Karan explaining the new format of the ‘Live Shows’ round. Each of the 7 members in the 4 teams would be performing solo and trying their best to entertain the audience and impress the judges. 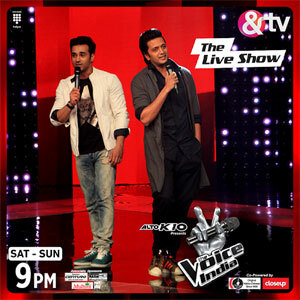 Team HR and team Mika would be performing on Saturday and team Shaan and team Sunidhi contestants on Sunday. Back to the studio and the contestants from all four teams entered onto the stage followed by the four coaches who together sang ‘Om Shanti Om’ from Karz. It was then time for the live shows to begin! But before that, the audience were re-introduced to ex Voice India contestant Meet Jain (Meet was sadly eliminated during the Battle rounds) as he was in the ‘red room’ where he would be seen interacting with the contestants and their families throughout the episode. 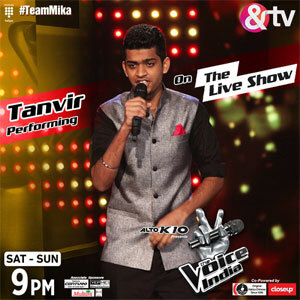 Team Mika were first to perform, and the first contestant was Tanvir Singh. Tanvir sang ‘Tarki Chokro’ from PK. At the end of his performance, coaches HR and Mika had both given Tanvir a standing ovation. Coach HR had said that this was an outstanding performance. He also added that his jacket (which had his initials on the back) would be given to the best performed of the evening! Team HR were next and contestant Mona Bhatt was the first to perform. She sang ‘Albela Sajan Aiyoni’ from Hum Dil De Chuke Sanam. After her performance, Mona received a standing ovation from coaches Mika, Shaan and her team mentor coach HR who was very happy with her performance! I must add that results of these performances would only be announced during the elimination rounds once everyone has performed from both teams. The next contestant from team HR was Sanjana Bhola. Sanjana sang ‘Jugni Ji’ along with backing chorus vocalists. After her performance, Sanjana too received a standing ovation from coaches Mika and Shaan. Coach HR was extremely happy with her performance! Saturday’s show had special guests Riteish Deshmukh and Pulkit Samrat who were there to promote their upcoming film Bangistan. Also, a special mention to the wonderful musicians who gave outstanding support to all the vocalists during their live performances! Back to the performances, team Mika were next. Jyotica was the second contestant to perform and she sang ‘Chittiyan Kalaiyan Ve’ from Roy. Coach Mika said that even though this was a fairly easy song to sing, he enjoyed Jyotica’s performance. 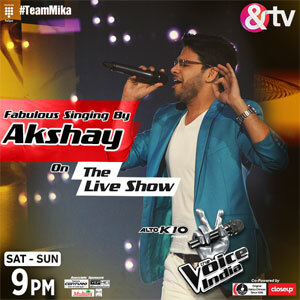 Team Mika were next to perform and this time it was Akshay who sang Bin Tere from I Hate Luv Storys. Coach Mika was very happy with his performance. Parampara (also from team Mika) was next to perform and she sang Pani Da from Vicky Donor. Coach Mika was extremely happy with her versatility! Parampara also sang Hey Shona with coach Shaan! Team HR were next with young Sakshi singing the wonderful Main Jahan Rahoon from Namastey London. Coach HR was very impressed with Sakshi’s performance as this was the first time the song had been sung by a female, as there are 2 male singers in the original song. 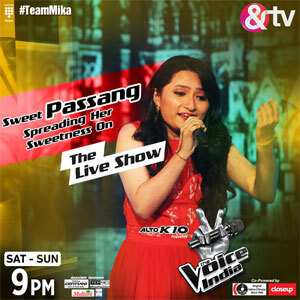 Team Mika bounced back with Passang who sang the retro Ajeeb Dastaan Hai Ye. Coach Mika was very happy with Passang’s performance. Team HR were next with music teacher Sachet Tandon singing Milne Hai Mujhse Aayi from Aashiqui 2. Sadly, this performance felt like the musicians were playing something else and Sachet was singing something else! Very unlikely performance from a Music teacher. Felt very bad for Sachet! Team Mika were back with Harjot who sang Pareshaan from Ishaaqzade. Coach Mika was happy with her performance. The last to perform from team HR was Deepesh. He sang Dagabaaz Re from Dabangg 2. After his performance, coach HR explained that Deepesh’s voice was not with him today and he could have performed a lot better. It was then time for the eliminations! Coach HR and coach Mika were only allowed to save 3 contestants out of 7 and the remaining 4 would be saved from public voting. Coach HR saved Sanjana, Piyush and Anish. Coach Mika saved Parampara, Sahil and Jyotica. Sunday’s episode opened with the fabulous four coaches singing the title song Dil Dhadakane Do. 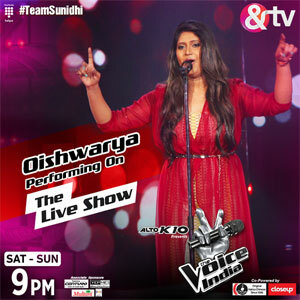 This episode would see the 7 contestants from team Shaan and team Sunidhi performing in the live show round. 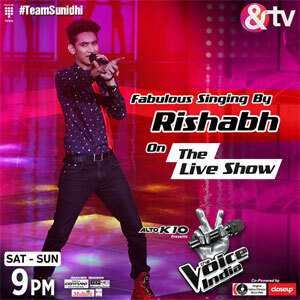 Team Sunidhi were first to perform with Rishabh who sang the Bachana Ae Haseeno title track. Coach Sunidhi was very happy with Rishabh’s performance and coach HR loved Rishabh’s red shoes! Team Shaan were next with contestant Arpita Khan. She sang O Meri Jaan from Life in a Metro. Coach Shaan said the beginning of the performance could have been better but overrall he was happy. Coach Mika loved Arpita’s smooth octave changes. Pawandeep was next to perform from Team Shaan and he performed Phir Se Udd Chala. Coach Shaan was so happy he lifted Pawandeep up! Coach HR also really enjoyed the performance from Pawandeep. He said if Pawandeep is safe he will be gifted his jacket too! It was then time for team Sunidhi who were back with contestant Oishwarya who sang Mohabbat Buri Bimari from Bombay Velvet. Coach Sunidhi was very happy with her performance! Team Shaan were next to perform with Snigdhajit who sang the Jhoom Barabaar Jhoom title track. After his performance, Snigdhajit received a once more from the audience! Team Sunidhi were back with Shristi who sang Halla Machchaye Re. Coach Sunidhi said that Shristi needed to control her energy. Coach HR gave Shristi a lovely compliment singing the retro classic ‘Tareef Karu…’ this naturally bought a smile to everyones faces! Parth performed next with Tune Maari Entriyaan from Gunday. Coaches Sunidhi and HR loved the performance. Pragya, who is also from team Sunidhi, also performed next with Baby Doll from Ragini MMS mixed with Kaliyon Ka Chaman. Coach Sunidhi was very happy with the performance. 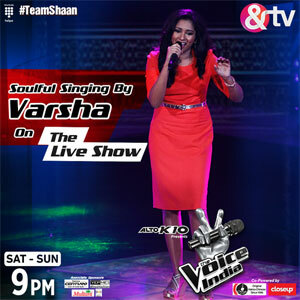 Team Shaan were next with Varsha who sang Banarasiya from Ranjhana. After her performance Varsha became emotional as she felt she had made a mistake yet coaches Mika and Shaan gave her a standing ovation! After Varsha, Vishwa performed with Saree Ka Fall Sa from R Rajkumar. Coach Sunidhi was very happy with his performance while coach Shaan felt that Vishwa took a risk with this song. Team Shaan continued to perform with Akash who sang Locha E Ulfat from 2 States. Coaches Shaan and Mika enjoyed the performance! Ritu was next to perform and sang Rang Lagade from Ram Leela. Coach Shaan was equally happy with this performance. Team Sunidhi then performed with Gopal who came in a new avatar with Pehli Baar from Dil Dhadakane Do. Coaches Mika and Sunidhi were very happy with the performance! Last but not the least, team Shaan performed with Sana who sang Noor E Khuda from My Name is Khan. Coach Shaan was very happy with her performance. Then it was time for the eliminations! Coach Sunidhi saved Oishwarya, Rishabh and Parth. Coach Shaan saves Snigdhajit, Pawandeep and Varsha. The remaining contestants would be saved from public voting. Watch The Voice India every Saturday and Sunday 9pm only on &TV with written updates from BollySpice every week!